As posted on Northumberland Today, May 27, 2013. COBOURG - The Rotary Club of Cobourg has three major fundraising events each year; The Waterfront Festival Arts & Crafts Festival held on the July 1 weekend; Sporstman’s Night held in February and Ribfest held in August. These three events raise nearly $200,000 each year and these dollars are held in a separate account and then invested in a wide variety of projects -every thing from The Cobourg Community Centre all the way down to providing dollars towards the purchase of new uniforms for the Cobourg Legion Pipes and Drum Band. None of the dollars raised are used for club costs, which are covered by annual membership fees. All funds are administered by various Rotary Club Committees dealing with the individual resident’s (Special Needs Committee) ; youth work (the New generations Committee); international needs (World Community Service Committee); youth education (International Youth Exchange Committee); local literacy initiatives (Literacy Committee) and for major projects, the Club’s Projects and Community Events Committee. Cobourg Rotary Club members serve on as many as three different committees during each year. Dollars to be invested are and administered by individual committees for amounts up to $3,000 and those over $5,000 must be approved by a majority vote by all club members. If you have ever wondered just where all the dollars raised go, the following will provide a clear picture of the dollars provided during the first ten months of the Club’s current year which runs from July 1 to June 30. • $3,000 to the United Way Backpack program. • $1,000 to the Cobourg Clippers Midget Softball Team to help offset costs for the Canadian Championships in Fredericton. • $500 to the Cobourg Dragon Boat and Canoe Club to assist young members attend the National Championship. • $7,736 towards the cost of Camp Enterprise. • $3,200 towards the Water in Honduras project, in cooperation with the Toronto Rotary Club, CIDA and Care Canada. • $1,500 to the Rotary Club of Battambang, Cambodia, to assist in the purchase of a Tuk Tuk to be used by the Battambang Women's Shelter for transportation (in co-operation with Rotary Club of Whitby Sunrise). • $3,000 to support of the Port Hope High School, East Northumberland Secondary School and Cobourg District Collegiate Institute West High School "sweat equity" project in Kilema, Tanzania, for school maintenance materials and travel assistance for 18 students. • $3,500 to Sleeping Children Around the World for the distribution of bed kits in India. • $5,000 to MSF (Doctors Without Borders) to assist with the medical needs in a terrible situation in the Upper Nile State, South Sudan. • $2,500 to the Medical Brigade/Friends of Honduran Children for the purchase of medical supplies, drugs and support supplies to be distributed during a medical visit to Gracias Honduras. • $1500 towards the construction of a wheel chair ramp for a handicapped person. • $717 to the Salvation Army to assist with cost of dental work. • $1,500 to the Cobourg Library to support their annual Share Your Stories contest. • $14,605 to the Transition House Coalition of Northumberland for the purchase of 15 metal bunk beds and 10 vinyl mattresses following an outbreak of bed lice. • $587 towards the repair of a furnace for an elderly woman. • $1,000 to the The Giving Tree with matching donation from the Port Hope Rotary Club. • $2,400 to the Church on the Hill for an inflatable obstacle course. • $1,490 to the Amarok Society to support their “Teach a Mother – Change the World” program. Amarok Society teaches uneducated mothers how to read and write, and then teaches the mothers to be neighbourhood teachers – educating their own and their neighbours’ children every day in their homes, with astonishing result. • $1,000 to support the Guatemala Literacy Project. This project qualified for matching grants so the Literacy Committee’s donation was leveraged up to $3,500 as follows: Cobourg Rotary donation $1,000, 50% match from the Rotary Foundation, 100% match from District 7070 Dedicated Funds, 100% match of the D7070 Dedicated Funds from The Rotary Foundation. • $132 for tread for the ramp built by Rotarian Al Rose for a disabled resident. • $7,737 is Cobourg’s share (almost 50%) of the amount provided by the six Rotary Clubs in Northumberland to Camp Enterprise. • $12, 962 to Transition House for new bunk beds and mattresses. • 5,000 to the Cobourg Legion Pipes and Drum Band for a new uniform. • $1,000 to support a nurse in Cobourg to go to Argentina for the Work the World program. • $1,068 to purchase teaching aids for the Lawson Outdoor Education Center. • $1,489 for the purchase of an electric wheel chair for an MS patient in Cobourg. • $750 to assist with funding for a special bed and mattress for another MS patient in Colborne. • $2,500 to the Center for Individual Studies for their academic awards program. The Center helps individuals who need training, retraining or upgrading in todays information based society. • $1,500 to support Emma and Julia Mogus with their "Book with No Borders" program. Following their presentation to the club, members coughed up another $1,500 in cash! The program donated 15,000 books to First Nations in Northern Canada. • $1,000 to help with expenses for student Rebecca Lasaer to do a sweat equity "Me to We" program in Ecuador. • $1,695 to support a local Community Safety Net program - a unique safety awareness and educational program that saves lives. • $4,430 to Rotary International Polio Plus. • $5,000 to Emmanuel International Canada for materials and services to construct classrooms and latrines in Malawi. Bill Johnson is a member of the Rotary Club of Cobourg. As posted by the Seaforth Huron Expositor May 24, 2013. After a first visit to Sri Lanka distributing bed kits to needy schoolchildren a year ago, Chris Hills couldn’t wait to get more involved with the Canadian charity Sleeping Children Around the World. 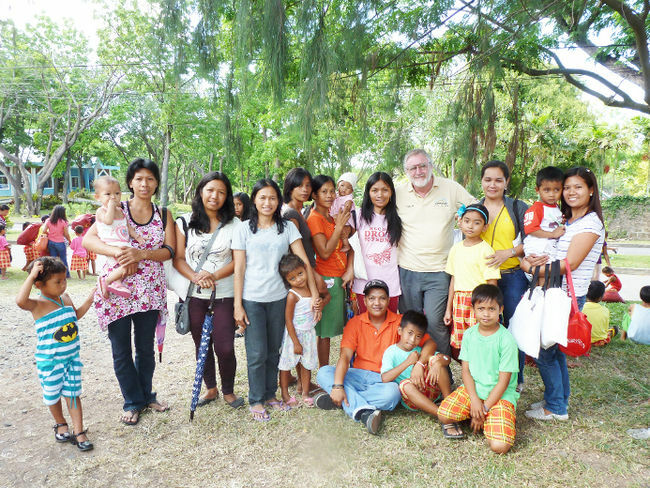 The Seaforth man volunteered to take on the responsibility of team leader and just returned from his first of many trips over the next three years to the Phillipines. “These trips are beautiful and tragic all at the same time,” says Hills, adding that a $35 bed kit can improve living conditions for an entire family in the Phillipines. Sleeping Children Around the World was founded in 1970 by Murray and Margaret Dryden, of Etobicoke, who wanted to see every child in the world benefit from the comfort of a good night's sleep. The bed kits provide a mat or mattress to get a child off the concrete or dirt floor, a pillow, sheet, blanket, mosquito net, five t-shirts, three pairs of shorts, a rain poncho, a towel, flip flops and school supplies and are made in the countries where they are distributed to support the local economy. In the Phillipines, the children who receive the kits are living in 10-foot by 8-foot tin shacks with dirt floors and no running water or toilet. Many of the families earn enough to spend $1 a day on the family’s food. “They live in absolutely desperate circumstances and it’s quite tragic when you talk to the parents. They are dirt poor and get embarrassed talking about it,” he says, adding that Sleeping Children representatives talk to the families to find out what they can add to the bed kits that would be helpful. “In the Phillipines, they all said Vitamin C because they can’t afford fruit. They eat mostly rice and sometimes fish. All these mangoes and beautiful fruit around them and they can’t afford it,” he says. While the Sri Lanka trip took Hills took a rural area where the residents were subsistence farmers, in the Phillipines, he saw poor urban families who can’t grow their own food. Hills and his team, which included Sharon Flanagan, of Mitchell, helped to distribute 6,000 bed kits during their most recent trip. While each family will only receive one bed kit, Hills says the mosquito netting, which is specially treated with insect repellant, is large enough to cover most of the dwellings the families live in. “I saw one family of seven living in the space the quarter of my kitchen. We don’t realize we’ve won life’s lottery living here in Canada,” says Hills. Describing the slums as “totally Dickensian,” he says he’s still never seen happier children than those living in the slums of the Phillipines. As team leader, Hills has the job of taking photographs of each child who receives a bed kit and them sending those photos to the donors who are usually in Canada or the U.S. He points out that 100 per cent of the $35 donation that buys a bed kit goes directly to the bed kit, none of it to the administration of the organization. “Photography is accountability – it shows where the money went. 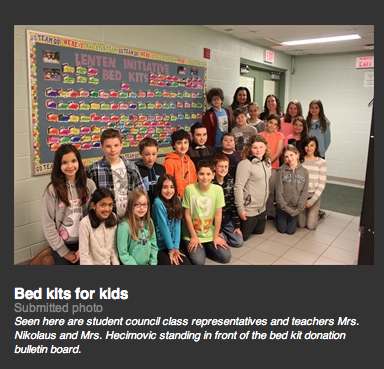 Everyone gets a photo with a bed kit with their name on it,” he says. While there’s more work and responsibility in the role, Hills says the perk is more opportunity to travel and distribute more bed kits. He will distributes thousands of bed kits over the next three years but points out that the actual number will depend on the number of donations the organization receives. Because he and his wife Gail made several speaking engagements after returning from Sri Lanka, Hills says he is available to spread the word about the work of Sleeping Children Around the World to any interested groups in Huron County. “The expectation is that you’ll spread the word,” he says. Chris Hills can be contacted at kithills@hotmail.com or 519-522-1913. Sleeping Children Around the World (SCAW), a Canadian international charity dedicated to providing bedkits (bedding, clothing, school supplies and mosquito nets) to children living in underdeveloped countries, will celebrate the fifth annual Pinehurst Club Breakfast on May 14, 2013. Canadian hockey legend Paul Henderson will act as keynote speaker. Paul is a member of the Canadian Sports Hall of Fame, was named to the Order of Canada in December, and will be inducted into the International Ice Hockey Federation Hall of Fame in May 2013. His personal story of triumph, including a battle with leukemia since 2010, will set the stage for a presentation on innovative insights and humourous anecdotes not to be missed. Paul's personal connection with the charity began early in his NHL career, playing against Dave Dryden, current SCAW Chair, and brother Ken Dryden. The Pinehurst Club Breakfast is held annually at the Fairmont Royal York Hotel and raises operational funds through the local business community for SCAW to sustain the organization's strength as it continues its vital work with children in need around the world. This event has heightened awareness around one of Canada's truly exceptional charities within the business community while raising more than $400,000. All of the proceeds from The Pinehurst Club Breakfast will support SCAW’s Legacy Fund, of which the interest supports the operating expenses of SCAW so it can continue to be a 100 per cent charity. Since SCAW’s founding in 1970, the charity has raised more than $23 million to provide bedkits for more than 1.25 million children in 34 countries. For every $35 bedkit donation, 100 per cent reaches a needy child. For more information on SCAW, please follow the team on Facebook (facebook.com/SCAW100), Twitter (twitter.com/scaw100) or visit www.scaw.org. As posted on Coastweek Kenya, May 3, 2013. Coastweek -- Inner Wheel Club of Mombasa President Poonam Thapa presenting the club banner to R.I.P.P.R. 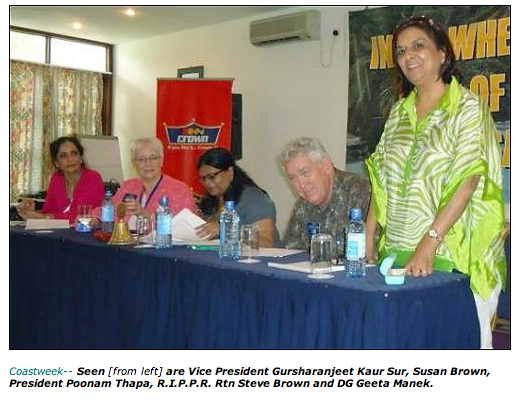 Rtn Steve Brown while Susan Brown and DG Geeta Manek looks on. • The membership being open to spouses of Rotarians, Rotaractors, Lady Rotarians, Female relatives of Rotarians or Inner Wheel Ladies and even members of the community showing keen interest in social work. • There is only one general meeting per month and additional committee meeting if one is on the committee. • Inner Wheel offers a tailor made outlet to all those ladies who would rather do small projects than get too deeply involved in community service. • Inner Wheel friendship and communication between Clubs. • Kenya and Uganda joining hands to create an Inner Wheel District. The open session was followed with a talk on Breast Cancer by Antonetta Acharya. She outlined the work undertaken by Breast Cancer Support Group in early detection and prevention of Breast Cancer. The forum then continued with service reports of the various clubs. It was indeed quite a revelation how much Inner Wheel helps the community in the District 9200. Various projects were mentioned like supporting old people’s homes, donating bed sheets and blankets, helping the cancer patients, donation of maternity equipment, donation of wheelchairs etc. • IW Club of Kampala works with SCAW “The Sleeping Children Around the World” project to donate bed kit, (a mattress, pillow, pair of bed sheets, mosquito net, blanket, school bag, towel, basin, a pair of pyjamas, and a pair of slippers) to school going children. • Other Clubs from Uganda mainly donate food items and assist in medical help wherever necessary. • IW Club of Nairobi mostly supports Cancer patients. • The Inner Wheel Club of Mombasa has three main projects; Microfinance, Breast Cancer treatment and support and Secondary or Vocational Education of girls. They also hold eye camps and provide for the surgery of any cataracts detected during the camp. They hold their annual Christmas party for a Children’s Home, donate wheelchairs and give support to the HEART foundation by donating sanitary napkins to girls. They raise funds through a Charity walk and depend on the well wishers and friends in the community. District Governor RTN Geeta Manek in her address appreciated the service to mankind done by the IW ladies. She reiterated the point put across by IW Club of Mombasa President Poonam Thapa that be it Inner Wheel or Rotary, whichever banner the ladies worked under it was eventually service to the community. She was emphatic about IW supporting the Rotary in Eradication of Polio. She also stated that more enthusiasm was required to increase the membership of all the clubs. She planted the seeds of the idea that IW works for a cancer hospital in Mombasa and offered full support after the IW initiative. DG Geeta Manek was accompanied by Rotary International President’s Personal Representative RTN Steve Brown and his wife Susan. He shared his experiences of his visit to Afghanistan and the circumstances of girls and women there. He was highly appreciative of the role women play in moulding the society. The official business of the forum was closed by IW President Poonam Thapa with a few words and quotations. “Be an opener of doors for such as come after thee, and do not try to make the universe a blind alley” for “Real joy comes not from ease or riches or from the praise of men, but from doing something worthwhile”. Do not think you cannot move forward as you may be alone. “I am only one, but I am one. As long as we are ready to share happiness “The flower of kindness will grow. Maybe not now, but it will some day. After lunch Shamim demonstrated fruit carving and salad decoration in the afternoon session of the forum. The IW ladies were impressed by her expertise and felt contented on having learnt some skills. The forum was indeed a great success. Special thanks go to IW Club of Mombasa Secretary Nafisa Khanbhai and Vice President Gursharanjeet Kaur Sur, committee member Antonetta Acharya and all the members who attended the forum.